The air was thick at Catapult Studios (609 Saint Ferdinand Street) in the Bywater, on September 1. There were industrial-size fans blowing, people sitting in a large circle sometimes singing, sometimes playing music, and always telling stories. The event was called “Stories of Survival,” and we talked with two of the folks — Jayeesha Dutta, a member of Another Gulf is Possible collaborative and strategist for Story Shift, which is a project out of Working Films, and Fernando Lopez, a collaborator with Another Gulf is Possible and a photographer in New Orleans — who were behind the scenes making this environment available to all. Dutta and Lopez know how important narratives and collaboration are, and at “Stories of Survival,” there were translators, group activities, music in the round, leaders, listeners, and discussions about how the stories of individuals fit into the larger stories created by a community. This layering of partnerships is palpable when attending an event like “Stories of Survival” because this initiative is part of even larger initiatives. “Stories of Survival” is currently on tour, having been to Houston and New Orleans, and then heading to Puerto Rico on September 17. In each new place, the community gathers together to tell their own stories and to listen about what still ails and afflicts those affected by trauma, disasters, and even the supposed “help” that came, and has not possibly gone. It’s not a matter of if another disaster will occur but when, and although support comes in waves, those waves can get smaller and less impactful as time passes, even though the need for help is still high. That’s where storytelling and community really come in. 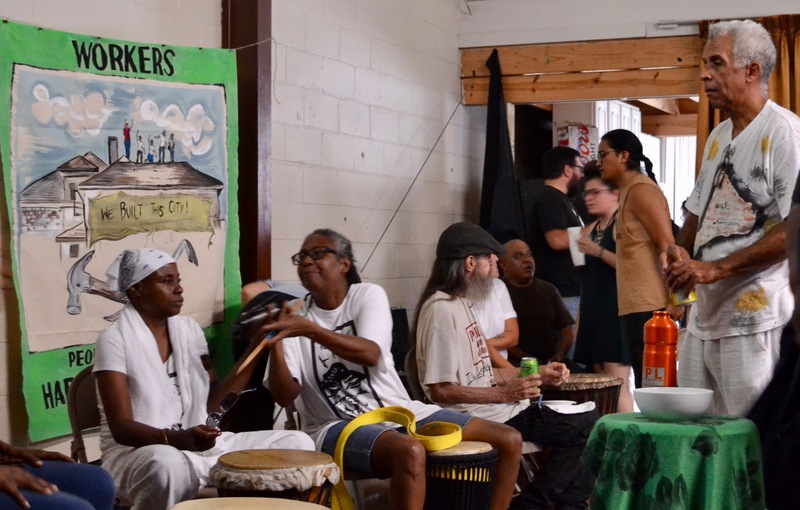 The trusted voices on September 1 ranged from the Guardians of the Flame, the Congo Square Preservation Society drummers, and the New Orleans People’s Assembly to anyone who told stories through the form of song, dance, paintings, and not only community interaction but community togetherness. “Stories of Survival” is heading to Puerto Rico on September 17 to hear more people tell their own stories, but even though the event has left New Orleans, the words and actions of those who want to help are still here.